Aida and Jenni earn their CCMA! 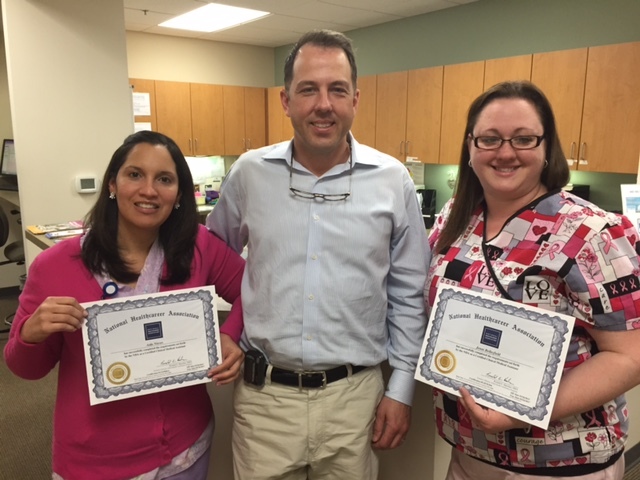 Please join us in congratulating Aida Nieves (left) and Jenni Bellesfield (right), who just completed intensive training to earn their Certified Clinical Medical Assistant (CCMA) certification. Also pictured is Dr. Thomas Beetel (middle), who along with Dr. Robert Howard and Dr. Joseph Levan of Spring Ridge Surgical Specialists, fully sponsored Aida’s and Jenni’s studies. Aida and Jenni enjoyed the incredibly challenging coursework the CCMA required. Having previously earned their Medical Assistant credential, their new CCMA certification enables Aida and Jenni to take their patient care responsibilities to the next level. As multi-skilled healthcare providers, Aida and Jenni are now certified to perform tasks such as interviewing patients, measure and record vital signs, prepare exam rooms, clean and sterilize medical equipment, administer injections, perform venipuncture and assist with EKG’s, all under physician supervision. Congratulations Aida and Jenni! Thanks for all of your hard work to earn the CCMA! Jenni & Aida you girls should be very proud of yourself. Great Job! Thank you Angela! We are so very proud of Jenni and Aida, and thrilled to work with them at SRSS!